As I watch thousands of people on the Ramblas (the site of a brutal terrorist attack a month ago) in Barcelona and hear an entire city banging utensils in solidarity, I am reminded that 21 September is International Day of Peace. 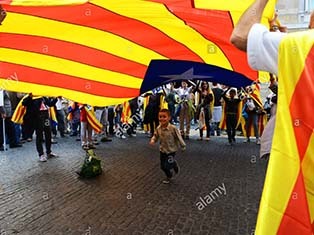 People of Catalunya are protesting because the Spanish national government based in Madrid has arrested democratically elected leaders of Catalunya to prevent a referendum on self-governance which was due to be held on October 1. Federal police has destroyed ballot boxes and threatened dire consequences for defiance. 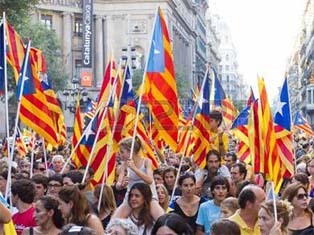 Yet, thousands throng the streets of Barcelona. Last weekend, I witnessed a similar phenomenon in Glasgow. 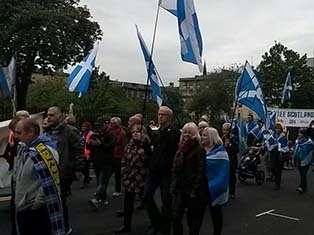 Thousands of Scottish people marched on the streets — with flags, music, drums, bagpipes, dogs and kids — to express their demand for greater autonomy from the control of the national government based in London. Both movements have been labeled as freedom movements, though in effect they are expressions of local society wanting to take greater control over their lives. 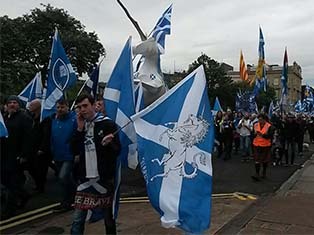 People in Scotland and Catalunya would like their language, culture and natural resources to be the basis of their education, livelihood and community relations. It is a matter of their identity. People of Catalunya and Scotland are patient, peaceful and hopeful. They believe their solidarity will advance the realization of their hopes for self-governance. But there are many territories, jurisdictions, communities and linguistic formations where violence has become the norm to seek recognition of one’s distinct identity. This year, the focus of the International Day of Peace is on mutual respect, safety and dignity — peace for all in everyday life!! Devolution from centralized totalitarian control of national governments and national capitals to autonomy for self-governance to such cultural distinct communities in agreed upon domains may be the most potent instrument for maintenance of peace and solidarity. Each nation-state can create self-governing mechanisms for providing space and autonomy to multiple such communities in search of identity. Such an approach will swiftly remove many conditions that continue to generate violence, and thereby destroy peace-building, from around the world. International Day of Peace began to be celebrated in 1891. The International Peace Bureau based in Switzerland is a civil society network which received the Nobel Peace Prize way back in 1910. While the United Nations will witness ringing of the Peace Bell today, it is important for citizens around the world to hear, and shout, the bugle of peace everywhere. We need to recognize how many places and communities are fighting to preserve their language, culture and identity in the face of national and international forces of homogenization. Support to linguistic, cultural and institutional diversity across race, ethnicity, religion and territory may well become the best mechanism for peaceful co-existence. Last year, on this day, Martha Farrell Foundation convened a shared reflection in honour of Martha and many other innocent citizens who have been killed in crossfires of violence triggered from a search for self-governance. Let us rededicate ourselves to mutual respect, safety and dignity—as pillars of peace in 2017!